On november 9th, this year’s biggest Nordic fantasy film opens in Norway. Journey to the Christmas Star is a family friendly and Christmas themed adventure, previously known as a stage play and a 1976 feature adaption. It’s been almost a year since we reported on the 2012 version of Journey to the Christmas Star, but this month it opens nationwide in Norwegian theatres on November 9th, and is planned to be screened in 225 theatres before it premieres in other countries. The 29 million NOK (around 5 million USD) feature is based on a 1924 stage play written by Sverre Brandt, with a new script by Kamilla Krogsveen, but most people know the story from the 1976 film of the same name. 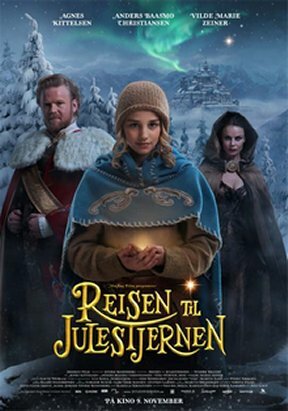 A film that has been shown on TV on Christmas eve for several years, and has become part of the Norwegian Christmas tradition. Comparison is inevitable, but the new version promises to be darker, more action filled and with a modern look. Journey to the Christmas Star is not only a remake of a beloved predecessor, it is also one of the most anticipated films of the year, perhaps only rivaled by Kon-Tiki, the biopic about scientist-adventurer Thor Heyerdahl, a film that opened this summer. According to producer Jan Eirik Langøen, the new journey is not really a remake of the previous film; “The 1976 version is different from the original script in a number of ways. We will be very faithful to the original script” Langøen says, and adds that a good story can be told again and again, as long as the format is updated and made relevant to new audiences. Langøen uses the many adaptions of Robin Hood to prove his point. The story of the 80 minute movie starts when 14-year old Sonja is hiding in the king’s castle, trying to escape from a gang of thieves. She overhears the king telling a sad story: After his daughter, little Princess Goldenhair, had disappeared in the dark forest on her search for the Christmas Star, the king, overwhelmed with grief, cursed the object of her disastrous search. Only if he finds the Christmas star, which was extinguished by his curse, within the few remaining days before next Christmas, Goldenhair will return to the castle – if not, she will be lost forever. Sonja is determined to help the king and find the Christmas Star for him. However, the evil witch and the treacherous count have also set out on a mission – to thwart Sonja’s plan and get rid of the heiress to the throne forever! On her adventurous journey, Sonja finds a variety of magical helpers. The forest elves show her the way to find the Christmas Star: all the way to the North Pole! Riding on the back of a big brown bear and soaring through the air on the North Wind are required to get there. How could a delicate girl like Sonja manage a trip so dangerous? The director of the film, a major production in Scandinavian terms, is Academy Award nominee Nils Gaup, helmer of the original Pathfinder, which raked in 100 million dollars worldwide and pushed Gaup to Hollywood. He started planning Waterworld with Kevin Costner, but left the project when the budget grew too much. He was also suggested as the next director in the James Bond film series, but chose to direct mainly Norwegian films, many of them on the epic scale such as the pirate adventure Håkon Håkonsson and the historical drama The Kautokeino Rebellion. This time, Gaup more than ever was allowed to paint big; “We will tell the story on a wide canvas, and avoid narrow images. It will be a movie where audiences can lean back and watch something very far from realism” he told Aftenposten. Abounding with charming characters, plenty of fantasy elements and set in a gorgeous snow-clad mountain scenery, the plot contains the perfect ingredients for a magical and beautiful adventure film. The film is essentially about a little girl who has to find out about herself and where she comes from, which – according to the director – amounts to a journey that everyone has to make; find the source of themselves to find out who they are. Gaup himself spent a few years at a public boarding school as a child, and left his parents aged seven. He had never seen a movie, theatre piece or TV image until 1961, when he was six years old and saw The guns of Navarone at a small, local cinema. Hanne Krogh, who played Sonja in the original 1976 film, said in a TV show that the new film has an important mission; “It is becoming more and more important in this secularized time [we live in], where our foundations are taken away from us, to still have these images that lead us ahead and tell us who we are, and show us the difference between good and evil”. Journey to the Christmas Star will be one of the most effects heavy Scandinavian films in recent years. More than 200 special effects shots were completed, mostly by the Norwegian studios Storyline and Gimpville. Gimpville’s work was also seen in Troll Hunter and in Kon-Tiki. Producer Sigurd Mikal Karoliussen is not worried about competing with big budget American blockbusters though; “After we saw Troll Hunter and [war biopic] Max Manus, [we never doubted using a Norwegian effects studio]”. For director Gaup, the film is a step into a new world, as it is his first fully digital film. This time it was cheaper and easier to make special effects than in his previous films, which were all more reality based. “I asked myself, what can be done with special effects these days? The girl in the story rides on the North Wind to the North Pole to meet Santa Claus, and we had to create a completely new universe. What can be done with digital is inspiring” Gaup said to Dagbladet. Since it was his first trek into major CGI, he said he “felt like a student”. To make the money stretch further, two thirds of the film was shot in the Czeck Republic, where the crew found Pernstejn Castle to be perfect for both exterior scenes and interiors. “When we saw the castle, we didn’t think it was real. It was a perfect match for the script. Should we build something like that, it would have cost at least 16 million dollars”, producer Jan Eirik Langøen said. The Czecks have hosted hundreds of foreign movie productions, and offered a professional crew that was three times as large as a normal Norwegian movie, without adding to the budget. Journey to the Christmas Star will be distributed internationally by Disney, which makes this the first time Disney launches a Norwegian film globally. A 90 second clip was shown at the film festival in Cannes this summer, which resulted in sales to 40 countries. Today, a few months later, 74 countries have bought the film. “This is a classic adventure tale about a lost princess. It travels easily” producer Sigurd Mikal Karoliussen said to VG about the possibilities of launching the film overseas. “We wanted to make an advenure where everything felt real. The same feeling you got from Lord of the Rings, that’s our target” he added. Journey to the Christmas Star has been sold to the UK, Brazil, Japan, Russia, Germany, China, Yugoslavia, Indonesia, the Middle East, Thailand and Turkey, among others. The film stars newcomer Vilde Zeiner in the lead role as Sonja, and Eilif Hellum Noraker, Anders Baasmo Christiansen, Agnes Kittelsen, Andreas Cappelen, Jarl Goli and Knut Walle in other parts.